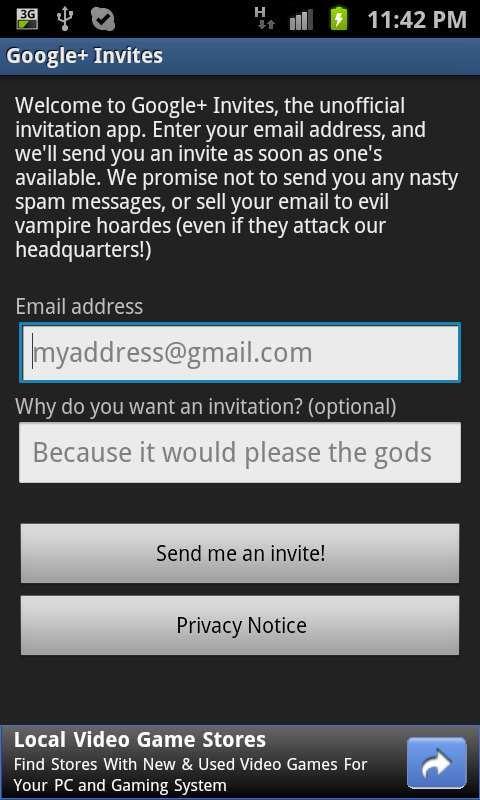 Do you want an invitation to Google+ (Google Plus), the new social network from the creators of Android? Download this app to get an invite from the guys who are already inside. NOTE: This app is not affiliated with Google in any way. I repeat: this is an unofficial app, written by an Android developer who is NOT working for Google. If you want the official Google+ app, you can download it from http://www.google.com/mobile/+/ Once you've submitted your email address, you'll be added to the list immediately. As invites become available, I'll process that list on a first-come-first-served basis. So the sooner you submit your request, the sooner you'll get an invitation. NEW: Due to the large volume of requests, I've implemented a "points" system whereby you can get your request accelerated. I'll invite people with the most points first! Any questions or concerns, please email me: thebigbyte@gmail.com This app uses Google Analytics to track basic application usage.